In a free, public event, William Villalongo A'99, assistant professor in the School of Art, will present some of his works and discuss his co-curating the Black Pulp! exhibition at the International Print Center New York. "Black Pulp!" examines evolving perspectives of Black identity in American culture and history from 1912 to 2016 through contemporary works of art and rare historical printed media. William Villalongo was born in Hollywood, Florida in 1975 and raised in the town of Bridgeton, NJ. His narrative and figurative works explore the mythical as a metaphor for the black presence in art and society. Villalongo's figures toil between various histories and an endless natural world, conscious of Painting as their condition of being. He received his BFA from The Cooper Union for the Advancement of Science and Art and his MFA from Tyler School of Art at Temple University. He is the recipient of a Louis Comfort Tiffany Award and Joan Mitchell Foundation Grant. 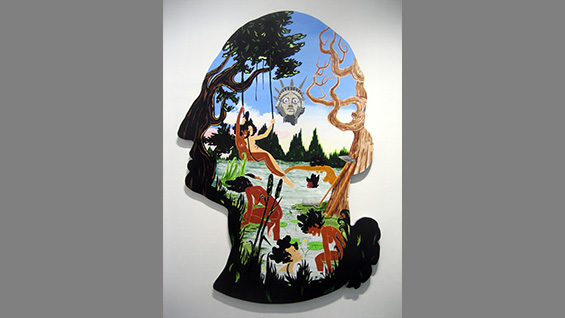 His work resides in several notable public collections including El Museo del Barrio, The Studio Museum In Harlem, Princeton University Art Museum, The Weatherspoon Museum and The Whitney Museum of American Art. William Villalongo currently lives and works in Brooklyn, NY and is Assistant Professor at The Cooper Union School of Art.